It’s the season for lots of gingerbread man activities! Preschoolers love them! 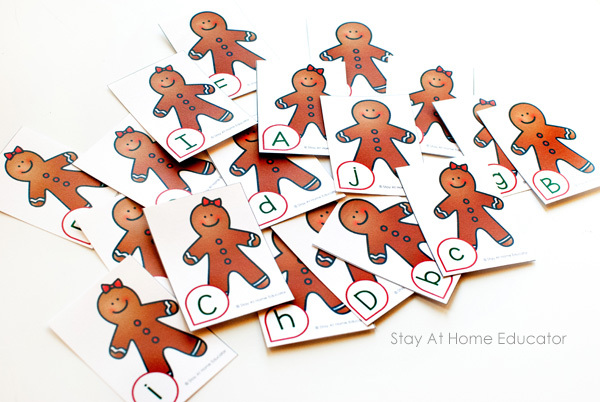 This is a gingerbread man theme Old Maid card game that your preschoolers are sure to love as well. 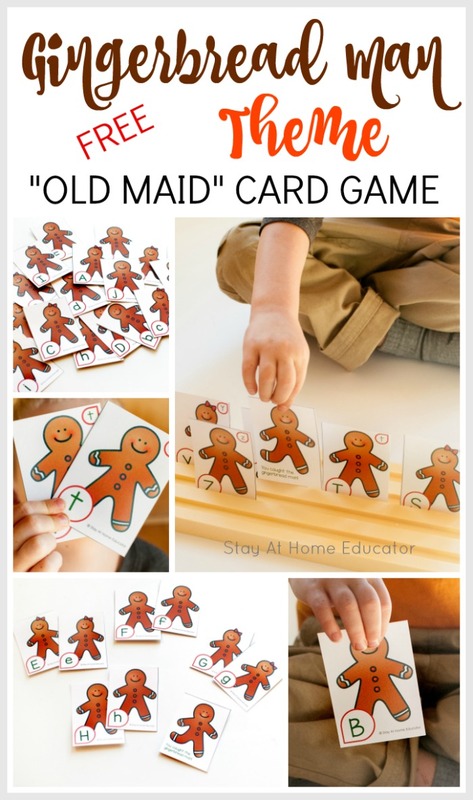 Be sure to grab a free copy of your gingerbread man theme Old Maid card game at the end of this post! 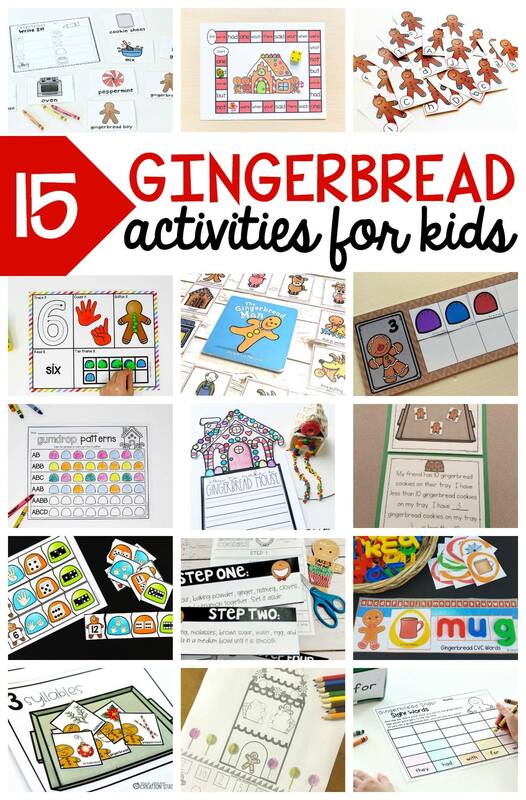 Oh, and check out a ton of other gingerbread activities I’m linking down there, too! Have you ever invited your preschooler to play Old Maid? It’s hilarious. You know, preschoolers can hardly keep a straight face when they pull the old maid card. My daughter is now seven and she still giggles uncontrollably when an opponent draws the old maid card from her hand. Which gets the rest of us laughing, and from there things might get just a tiny bit silly. I’ve made a few Old Maid card game printables before. Our favorite is our farm theme card game. Err, um…that is until I made this gingerbread man theme Old Maid game. This one is now all the rage at our house! Part of it might be because of the upcoming holiday season, and part of it may be because with our gingerbread man theme version, there is no loser! This game requires almost no prep. Really, all you need are the cards and some preschool friends to play with! Do you call your preschoolers you friends? I do. To get their attention, I will often say something like, “Preschool friends!” They feel so special, and I actually use it for my kids, too! You can laminate the cards, but they will be slippery and difficult for little hands to hold. But that’s when a cardholder comes in handy. This is the one I use for my preschoolers. Like I said, this version of Old Maid has a slight twist. There is no loser. Actually, everyone ends up being a winner, which is always fun for preschoolers. I like “winning” games in preschool because it encourages preschoolers to cheer each other on and help out rather than play for their own gain. Of course, whenever there is a game with no loser, there are also no hurt or sad feelings to navigate, either. This is not a “cooperative” game, per se, which are fantastic, but close. So, to play the game, deal out all the cards to the players. It doesn’t really matter if on preschooler ends up with an extra card. And yes, the smaller group you have the more cards each player will have, which is why these card holders come in handy. Next, invite your preschoolers to make any matches they see within their hand. Lay those matches aside. Each player can keep track of their own matches. Select a preschooler to go first. That player draws a card from the player to his left. If the card is a match to one in his hand, he can place the match with the others he is collecting. 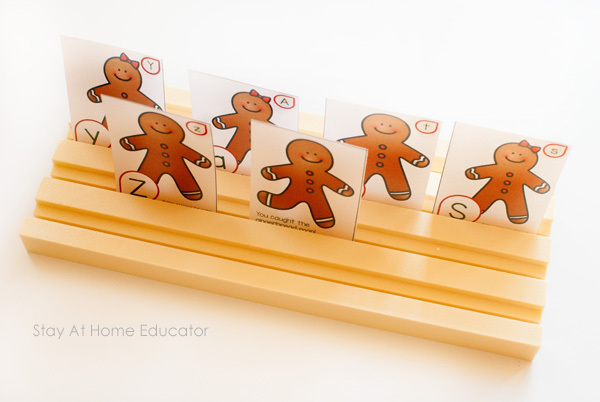 The game continues to the next player, each player drawing from the player to the left, and continues until all the cards have been matched and one player is left with the run-away gingerbread man card (“old maid”). 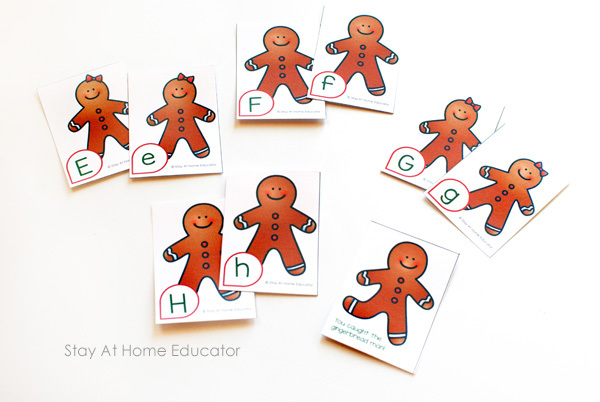 What is special about this gingerbread man printable? Well, each card not only have a cute cookie-like gingerbread man on it, or gingerbread woman, but each card also has either an uppercase or a lower case letter on it. So the preschooler’s task is to make letter matches. Now, matching letters can be difficult, especially if using the entire alphabet at once. 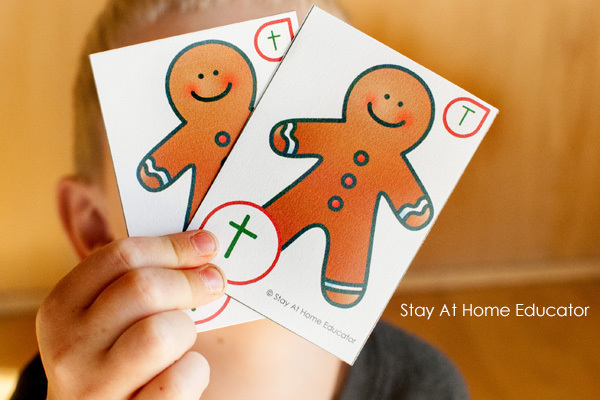 So, this free gingerbread printable comes with two versions of the game! One with just a single letter on the card and a second set of cards with the matching letter in the upper corner, giving away the answer. That way, younger preschoolers can have a little extra help if needed. So, two variations to use based on the skill level of your preschoolers. This is an excellent way to differentiate letter instruction in your kindergarten class, too! Here is where the game differs. The person left with the run-away gingerbread man is not the loser! Rather, the preschoolers celebrate for making all the matches in their hand so that the run-away gingerbread man could be caught! It’s a little silly, but the preschoolers love it. And bonus if you have them come up with their own song to sing at the end of the game. 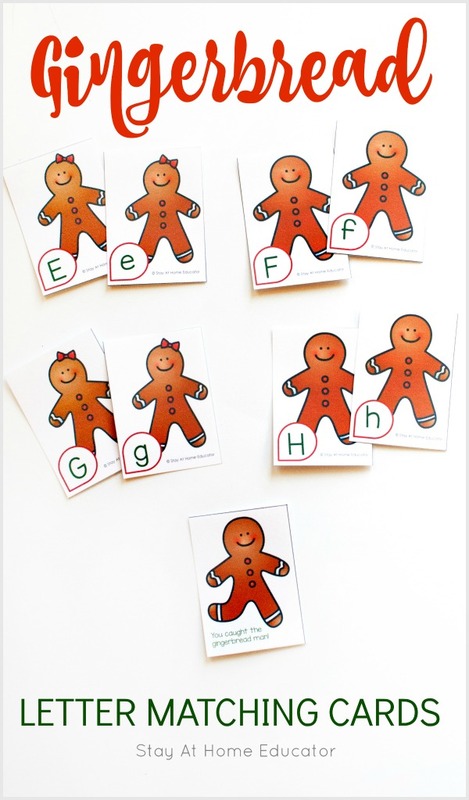 Because this is a set of gingerbread theme letter cards, there are a lot of fun ways to use them! Here are a few ideas. Use the alphabet cards to play a game of concentration. 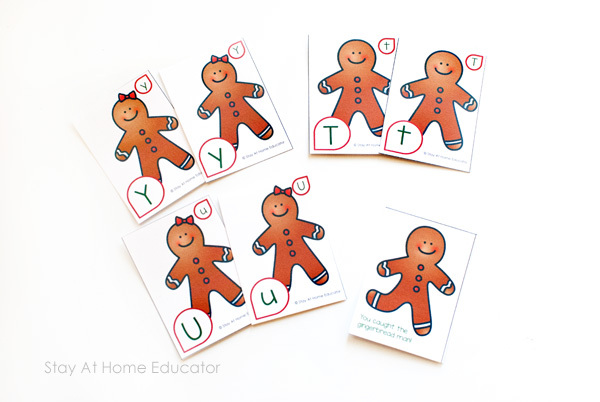 Use the gingerbread cards to spell out familiar words. Flash a card to you preschooler and have them go on an object hunt for an item beginning with that letter. Add some gross motor fun. Tape the uppercase letter cards to the wall and one-by-one give your preschooler a cards and have him race to the wall to make a match. How else can you think to use this free gingerbread printable? I’d love to hear your ideas in the comments! 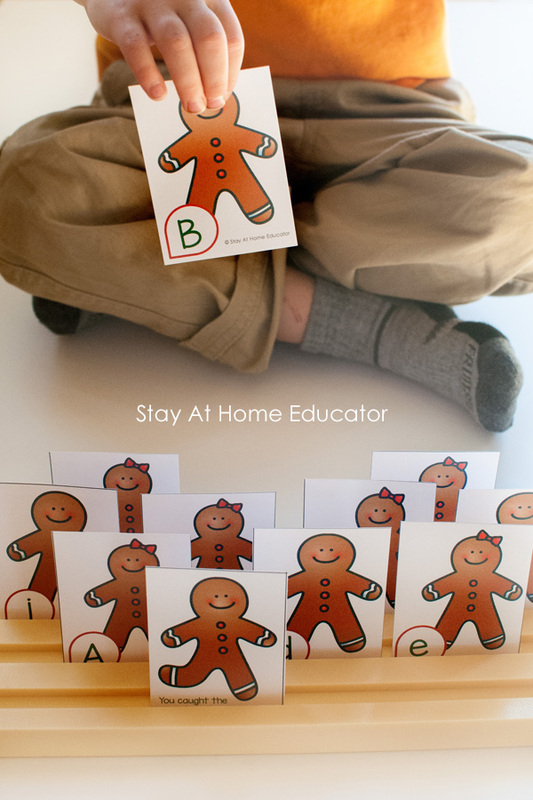 Looking for More Gingerbread Activities for Preschoolers? Here are even more activities for your gingerbread man theme! Have fun, but don’t forget to grab your free printable at the end of this post! I say this is an alphabet printable because of all the fun you can have with the cards. You can make this into more than just a game of Old Maid. But I have to admit, Old Maid is my favorite way to use the cards! Click the image below to grab your own copy. My kids will love it.He watched a video of gingerbread-man on Youtube and after that he is a big fan of it. These are so pretty! I am going to pin this for next month. I love that quote. Thank you for sharing. Thanks for these posts! They mean a lot to me!